The background of the root element becomes the background of the canvas and covers the entire canvas, anchored at the same point as it would be if it was painted only for the root element itself. The root element does not paint this background again. For HTML documents, however, we recommend that authors specify the background for the BODY element rather than the HTML element. User agents should observe the following precedence rules to fill in the background of the canvas of HTML documents: if the value of the 'background' property for the HTML element is different from 'transparent' then use it, else use the value of the 'background' property for the BODY element. If the resulting value is 'transparent', the rendering is undefined. This does not apply to XHTML documents. Even if the image is fixed, it is still only visible when it is in the background, padding or border area of the element. Thus, unless the image is tiled ('background-repeat: repeat'), it may be invisible. With a value pair of '0% 0%', the upper left corner of the image is aligned with the upper left corner of the box's padding edge. A value pair of '100% 100%' places the lower right corner of the image in the lower right corner of padding area. With a value pair of '14% 84%', the point 14% across and 84% down the image is to be placed at the point 14% across and 84% down the padding area. With a value pair of '2cm 1cm', the upper left corner of the image is placed 2cm to the right and 1cm below the upper left corner of the padding area. If only one percentage or length value is given, it sets the horizontal position only, and the vertical position will be 50%. If two values are given, the horizontal position comes first. 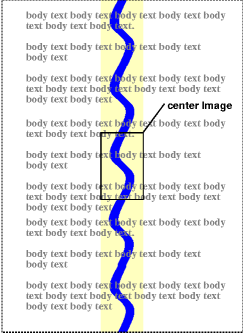 Combinations of keyword, length and percentage values are allowed, (e.g., '50% 2cm' or 'center 2cm' or 'center 10%'). For combinations of keyword and non-keyword values, 'left' and 'right' may only be used as the first value, and 'top' and 'bottom' may only be used as the second value. Negative positions are allowed. The computed value of background-position for the purpose of inheritance is undefined, since the allowed values on this property may have different effects in a child element due to differences in size and position of their respective boxes. For information about gamma issues, please consult the Gamma Tutorial in the PNG specification ([PNG10]).